My hubby really enjoyed this chicken casserole and so did I. This is comfort food at its best. You have to try it to believe me. The topping was so delicious with this...it took it over the top! We often buy roast chickens at the equivalent of Costco over here (called Price Smart), since it's cheaper than even buying and roasting it ourselves in the oven, although that would not be a bad idea sometimes, as home-roasted chicken is often nicer than store-bought. As a result, I have become lazy about it and only roast turkeys. Sometimes I have a chicken sitting in the fridge and it doesn't appeal to eat it just like that, so that's when it is nice to have a casserole or two to turn to. Someone is bound to ask me...in the background is Turmeric Roasted Eggplant. It's delicious and a great way to consume turmeric, a powerful anti-inflammatory spice. Some people don't like mushrooms. Here were my thoughts on substitutes on Facebook in reply to someone: For homemade mushroom soups - just blend the mushrooms in in a blender or simply leave them out and rely on seasonings. How about sliced zucchini or broccoli or I read somewhere that some people use tofu chunks. Sounds weird though, hey? Cooked sliced Japanese eggplant is another idea, but if he doesn't like mushrooms, he might not like eggplant either. Or make a different casserole with sauteed sliced peppers (all different colors) and onion - just make sure they are cooked soft enough. Even celery cooked soft with onions would be good. I was so chuffed when a lady on Facebook said this about the casserole: "I cannot say enough about this recipe! Wow! 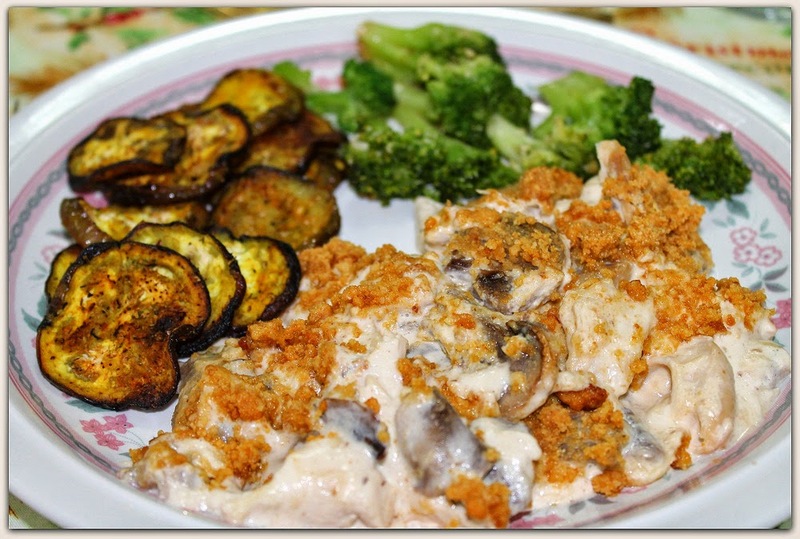 It is hands down the best low carb dish that I have ever made! And I have had some great dishes.... Thank you!!" In nonstick frying pan, in hot bacon fat, toss mushrooms to coat. Place lid on pan and cook until moisture evaporates. In large bowl, combine chicken and mushrooms. Prepare Condensed Cream of Mushroom Soup (just the concentrate), but leave out the mushrooms. Stir in sour cream. Add to chicken and mushrooms, along with Monterey Jack cheese. Stir to combine well. In 9 x 13-inch (23 x 33 cm) glass baking dish, spread chicken mixture. Sprinkle with “Bread” Crumb Topping and bake 20 to 25 minutes, until bubbly. “Bread” Crumb Topping: In medium bowl, combine “Bread” Crumbs, Parmesan cheese and butter. The crumbs should be moist, so add more melted butter, if necessary.